Going to Russia for vacation is exhilarating. Either go to big cities looking to pick up a girl or study their history in the ancient old town. Decide your goal before coming to Russia, it has many places you could visit depend on your purpose for travel. If you wish to enjoy their nightlife, then go to big cities in Russia like Moscow or Sochi. If you want to find scenic places different from your country, then go find either a small town or village. If you need to feel the coldness of the climate there, its also available in Russia which you could check in 7 coldest places in Russia. Going on vacation could cost you much, especially if your goal is shopping in big cities in Russia. But Russia didn’t just offer you with many things to buy, they offer much more which is not costly. You could enjoy many wildlife adventures for just a lower cost than spending your vacation in some big Hotel. Now if you want to enjoy their scenery, just go to big town in sky high building which is costly. Here is a suggestion for you, why not go to villages in Russia? They offer you natural, beautiful and most pretty scenery at a low cost. Also, one more important point to consider that I forgot to tell you especially Muslims people. Russia villages could offer you cuisines that not sold in other places. But still, for Muslims people they must pay attention to Russian cuisine some have pork as the ingredients. So before you plan where will be you going for your vacation in Russia, why not learn about their cuisines first. After you learn about what Russian cuisines, also places that are not nice if you weak to coldness. Next important thing you should know is what you should do or don’t in Russia. After done with learning a bit here and there, now you are ready to go. Now I will offer you my suggestion about 6 most scenic village in Russia for you to visit below. The first place is a village which nickname is “village that wanted to be a city” Vyatskoe. Why Vyatskoe? As the name suggests, this village keeps expanding their facilities to provide tourists with a better experience. Vyatskoe unique town-planning and architectural building will fascinate you with it. 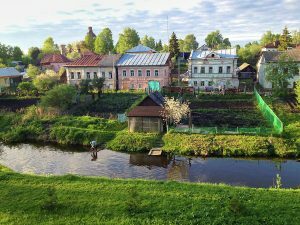 It also won The Most Beautiful Village in Russia in 2015 in the first place. What more, Vyatskoe has many rivers and lake which is why you could get the most scenic scenery in Vyatskoe. Summer or Winter, Vyatskoe will provide you with the most beautiful scenery it expanses could offer. You could find Vorzogory village in Onezhskaya Guba 25 KM to the western side town of Onega. Obviously, as a rural area, Vorzogory don’t have any interesting sites to look. But if your goal is to find the most scenic sunset in Russia, Vorzogory might give you the best picturesque. Also beside the sunset, the Monument of Wooden architecture is interesting to check while you were there. This village also offers you with the most scenic picture it could offer. Another thing about this village is, the easiest way to get there is by boat. So if you didn’t like to travel on the boat, better not come by here, why? By using road its difficult as you need to go around the lake with a rough road. On another hand, traveling by boat will get you there in no time. if you ever getting there, try to find the chapel on the hill and enjoy the great scenery of the Lake that surrounds the Buhalovo Village. Kimzha village joined Russian Most Beautiful Village Association by becoming the most beautiful village in February 2017. Although many villages in Russia could be said to be beautiful Kimzha come out on top of it, all because Kimzha offers many cultural events there, also many historical sites could be found here. Let us not discuss history, people also believe some of Kimzha permanent resident is of witch descent. also not lest interesting about Kimzha is you could feel many things related to harvest moon in which many events with the villagers participate in it. sacred custom and tradition in Kimzha also offer many great experiences, also seeing children playing in the courtyard, smoke rises in the houses, fishing on the river while enjoying the expanse, gathering berries, and hunting in the woods. All of these could be found in Kimzha and I think this village will get you the most exhilarating experience from the scenery to its activity. This village is close to nature by far, as it has river nearby and untouched valley with pure springs. Another thing to expect when you come by is the painting on the house of prosperous. These paintings have survived many years, but it still retains the nature in which the painter want to confide. Berries, mushrooms, birds and animals, and, most importantly, near the village is a narrow valley is a steppe for cattle pasture. could you already imagine the scenery there? What will you expect when you visit the fifth village? Obviously, it’s for the scenery as the title said. The scenery also wouldn’t lose if we compare it with another village. I think you will find the scenery even better in some areas, why? because Tarbagatay village is near some iconic tourist spot in Russia, like Lake Baikal, Ulan-Ude. You also could find Selenga River shines on the sun with its uncountable islands overgrown with verdurous motley grass, with many birds accompanying it. The description above is why I include Tarbagatay village in the 6 most scenic village in Russia for you to visit. Atsagat name comes from Buryat language which also means stone, it is 50 KM away from Ulan-Ude, see? After done visiting Tarbagatay you could visit here while also spend sometimes in Ulan-Ude, one stone two bird if I do say myself. In Atsagat village scenery is a bit like old china that you could see in movies, where you could find horses, Buddha statue even the 14th Dalai lama wax figure could be seen here. Many mountain and hills here with addition local springs called Shalot Arshan will provide you with the best scenery and enjoyable stay at the same time. Now I have listed 6 most scenic village in Russia for you to visit. Hopefully, you could go to three of the places listed above if not all. The most enjoyable experience is finding the most scenic place you could find and also enjoying their culture and tradition. You are on vacation right? Make the most of your time in Russia. Have a safe and enjoyable trips there.